Dubai: Godolphin’s Saeed Bin Surour has won the $6 million Dubai Turf (Group 1) the most number of times, but his attempt to win the 1800-metre contest for a seventh time could be thwarted by one of the most highly regarded horses on the planet — the Japanese superstar, Almond Eye. However, the Japan Racing Authority’s 2018 Horse of the Year needs to prove that she’s just as good on the international stage as she is in her native Japan, by upstaging a strong field of middle-distance turf specialists, led by Bin Surour’s Dream Castle (Christophe Soumillon), who is seeking a fourth straight victory over nine furlongs at Meydan. Trainer Sakae Kunieda, who admits that there is more to come from Almond Eye, said: “Even I don’t know where her limit is yet. Bin Surour, who is also represented by the progressive five-year-old Mountain Hunter, said: “Dream Castle worked very nicely on Saturday and has had a brilliant year already. He looks as good as he ever does and he’s walking around with a bounce in his step. We’ve been here a few times before but this is probably the best horse I’ve had here since Lucky Nine. “Obviously, this is going to be a stronger race, but he has risen to every challenge we have given him this year. “He has really thrived over nine furlongs this year and is unbeaten in three starts at Meydan, including a very good win in the Jebel Hatta on his latest appearance,” he added. “He worked well on Saturday and is in good form at the moment. “This is a very tough race, but Dream Castle has improved with each run this year and I think he is nearly at the same level as Benbatl, who won this race for us 12 months ago. “Mountain Hunter has also enjoyed his racing at the Carnival this season, and I think the drop down to nine furlongs will suit him,” said Bin Surour. Another interesting contender is Wootton, who like Dream Castle and Mountain Hunter, is owned by Godolphin. 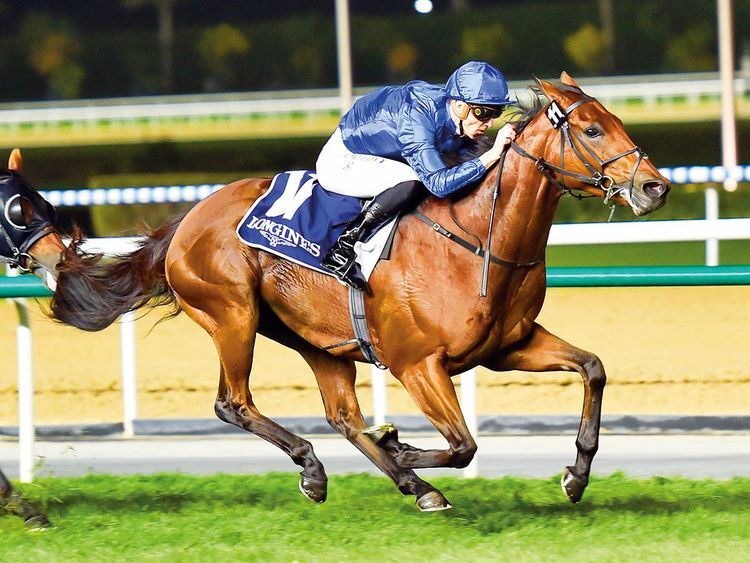 His trainer Charlie Appleby, said: “It looked as though Wootton enjoyed the step up to nine furlongs in the Jebel Hatta and he won’t look out of place in this line-up. “He seems more relaxed in his races — he travels well and is doing everything the right way round. Meanwhile, Vivlos, the 2017 winner and last year’s runner-up, lines up once again as does Group 1 winner Deirdre, who is a third member of Japan’s female team in Saturday’s race. Ireland’s record-breaking champion trainer Aidan O’Brien, who has saddled six previous runners in the race without success, looks to break his duck with I Can Fly, winner of last season’s Group 2 Boomerang Stakes at Leopardstown. Irishman David O’Meara also bids for a first success in Dubai with Lord Glitters while ex-Godolphin Racing Manager Simon Crisford is represented by Century Dream, who boasts two solid performances at Meydan during the Carnival. For the first time since 2014, Hong Kong is represented in the Dubai Turf with trainer Caspar Fownes’ charge Southern Legend aiming to upset the apple cart in Saturday’s 1,800-metre feature. The consistent six-year-old was most recently closing at the finish when runner-up in the local Group 1 Citi Hong Kong Gold Cup at Sha Tin in February. Mike de Kock won consecutive runnings of the Dubai Turf in 2003 (Ipi Tombe) and 2004 (Right Approach) saddles Yulong Prince, winner of the Grade 1 Daily News at Greyville in June.